After a little bit of a blogging break, I'm back :) I've been working pretty hard on the dresser I'm refinishing for Maddy. I hope, one day, when she's an adult, she knows what a freakin labor of love this is... Just when I thought I would be done, I screwed up one side of it - and now I'm going to have to re-strip that side, sand it back down and paint it again. I wouldn't say I've had any *weird* cravings. I certainly have foods I've been more drawn to - bananas at first, eggs, milk (which I guess is weird for me - I've never been a milk drinker), anything liquid - I'm always thirsty... But I haven't had any foods that made me think, "if I don't get this, I'm going to die. Right here, on the spot. Die." That's finally happened - and it's in the form of some good ole Jamba Juice. It's all I can think about!!! I've scanned their website looking at the different lovely conconctions and for local locations. I'd eat them for breakfast, lunch, and dinner - which actually wouldn't be *all* that unhealthy if I added a salad in with lunch a dinner. I mean, they have protein "blasts" to add to it so you're getting your protein. That's good enough, right? Seriously though, I had one on Saturday and my mouth is watering as I type thinking about it. 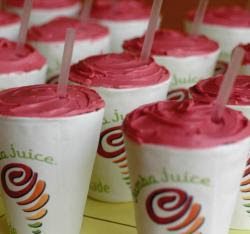 I hear the words repeated in my head, like a tribal drum, "Jambaaaa Juuuuice, Jambaaaaaa Juuuuuice". My husband isn't a big fan of us eating out - I pack my lunch 90% of the time and we don't visit restaurants often....but I'm telling you, in the name of all that is holy, I think I might have to give in to this craving for the duration of my pregnancy or I might go insane. Mmmmm! Heather, this is making me want a jamba juice real BAD!!!! :) I think I might have to beg my hubby to bring me one after work! I say, if you want one a day for the rest of your pregnancy, then go for it!